Hubrid Nox is back, and this time he's brought his undead army of slaves with him! 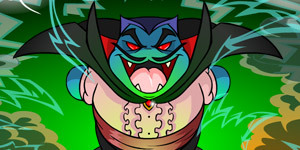 Can MAGAX beat back his former master, redeem himself, and save Neopia? You can't hide from me forever, Nox! I'll find you!! For each of the game's ten levels, MAGAX must destroy the displayed number of Scorchios at the top of the screen. Once the last Scorchio has been slain, he will automatically be whisked away to the next level. Enemies can only hurt MAGAX by running into him, and MAGAX can take five hits with a full health meter before he is killed. This game does not have any extra lives, so if you lose once, it's game over! The levels in this game are unique in that they wrap around to the beginning if you fly to the end. If you have difficulty finding that last Scorchio, you should run into it eventually if you keep flying in one direction. Use the arrow keys to choose the direction you want to fly; hold down the key to fly faster. Press the spacebar to fire your laser from your hands. Firing your laser uses up power; you can see how much you have left on the bar at the top of your screen. Your power is replenished over time, so if you run out, wait a few seconds for the bar to refill. Each level is populated with several kinds of enemies, including Hubrid Nox himself! Even though you only need to defeat the Scorchios to progress, the other enemies are worth points and need to be defeated if you want to get a high score. 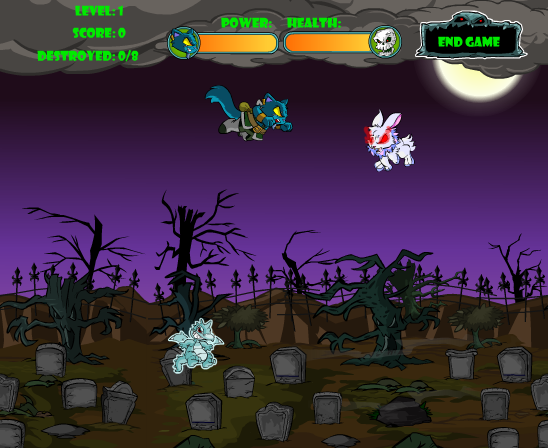 As the levels progress, the amount of hits each enemy takes to defeat increases. (10 points) Scorchios can breathe fire to shield themselves from your laser. In earlier levels they only take one hit to kill; in level 8 this increases to two hits, then three hits in level 9, and by level 10 you'll need to hit them five times to defeat them. (20 points) Cybunnies have a chance of transforming into Hubrid Nox! Hit them four times to defeat them. (1 point) JubJubs randomly appear on all levels and can be dispatched in one shot. Hubrid Nox When Hubrid Nox appears, he will shoot a flame that will disarm your laser temporarily before reverting back into a Cybunny. He is impervious to your attacks and cannot be defeated! Touching Nox while he is charging up will result in an instant game over, so be careful. Skull This may look like an enemy, but it's actually an item! When collected, it will refill your health meter. Be careful and take your time while playing this game. When fighting the undead, you should always keep a safe distance from them. The easiest way to do this is to fly back and forth in one spot while shooting, picking them off one by one. Keep a close eye on your "Destroyed" counter, you don't want to clear a level before you've defeated everything else first. When fighting Cybunnies, keeping them just off-screen will prevent them from turning into Hubrid Nox, saving you some headache. Make sure you zap all of the JubJubs you see, these are the only randomized enemies in the game and they make the difference for the high score table. If you want to get a trophy, you'll have to get lucky! Use the code xagam to replenish your health meter. This can only be used once per game. Keep the Cybunnies just off-screen to prevent them from turning into Hubrid Nox. Pass by one Scorchio per stage and come back for it later to ensure that you defeated everything else in the level first. If your health is full, don't collect the skulls. You can come back for them later if you need to. If you clear all of the enemies in each level, you will have enough points for the avatar around the beginning of level 10.